“Please Meet with Us!” They did. Click on photo for a larger version. 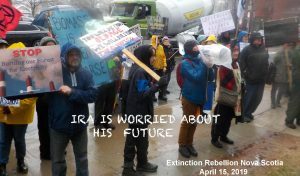 Close to 100 participants, including a large contingent that came in by chartered bus from the Annapolis Valley, joined the Extinction Rebellion (XR) events today in Halifax. Similar events were being staged worldwide. 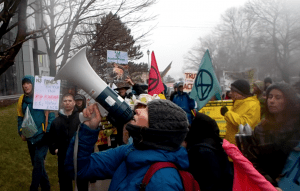 The XR Nova Scotia group went first to the Chronicle Herald on Joseph Howe Drive and then to CBC on Chebucto Road to demand that they “start reporting on the climate crisis and hold government to account”. XR reps were able to meet with media execs or reps at both locations. Ira and I spoke with 3 female executives of NSP, one Judith Ferguson, other names I didn’t catch. We are going to follow up with them. They don’t quite understand what’s going on with clearcutting in the forest the forest.. they thought they were only using wood wastes. They do seem to realize that biomass is only 22% efficient (“at best” many chimed in) but don’t seem to realize that is a failing grade. They say they are changing from coal and biomass as fast as they can; we explained to them that’s not fast enough. We are going to follow up with them. I have asked them to create a report to let us know about all of things they are doing to get off of of fossil fuels and to transition to green energy and that way we will have a chance to share all of that with you, and to let them know whether that is good enough or whether we need them to do more…I have given them the names of people we would like them to talk to, experts on biomass who can explain to them why biomass should not be on the renewables list. I was impressed with the “determined optimism” of the participants, and their respect for all. There was a constant, pleasant, even cheerful back and forth between protesters and police (there were at least 4 squad cars present and a half dozen or more police officers). Those that got arrested (4 people) pretty well volunteered for the arrests e.g., by deliberate jay-walking after being told that if they persisted they would be arrested. I was also impressed and thankful that XR-Nova Scotia got through to the senior NSP execs, and that there will be follow-up. That is progress, and you can be sure XR won’t stop there. In Nova Scotia, in Mi’kma’ki, the unceded territory of the Mi’kmaw people, the government continues to approve massive CLEAR-CUTS and whole-tree harvesting, that scrape the soil barren leaving it ripe for erosion. Our forests are burned in the biomass plants, creating energy that is only 22% efficient, emitting more carbon into the atmosphere than dirty coal. Northern Pulp has been polluting Boat Harbour for 50 years, and now wants to pipe toxic waste into fisheries’ water in the Northumberland Strait. Newly approved offshore oil projects threaten tourism $ and fisheries. All of these heavily polluting industries have been generously subsidized and supported by the government with our tax dollars. 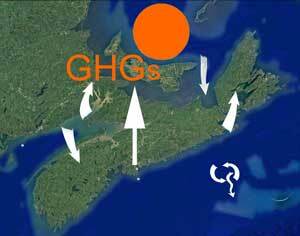 We are still burning COAL in Nova Scotia. Letters, reviews, reports and petitions have been sent for years. They’re not listening. We have now entered a CLIMATE EMERGENCY. We have run out of time. We need rapid action to change this broken system. There ARE solutions. The government just needs to support them. It’s time to join the Extinction Rebellion. Extinction Rebellion welcomes all people and regional activist groups to collaborate with XR, as long as you agree with our principles and values–you can find them here: https://rebellion.earth/who-we-are/ Together we will amplify our voices. 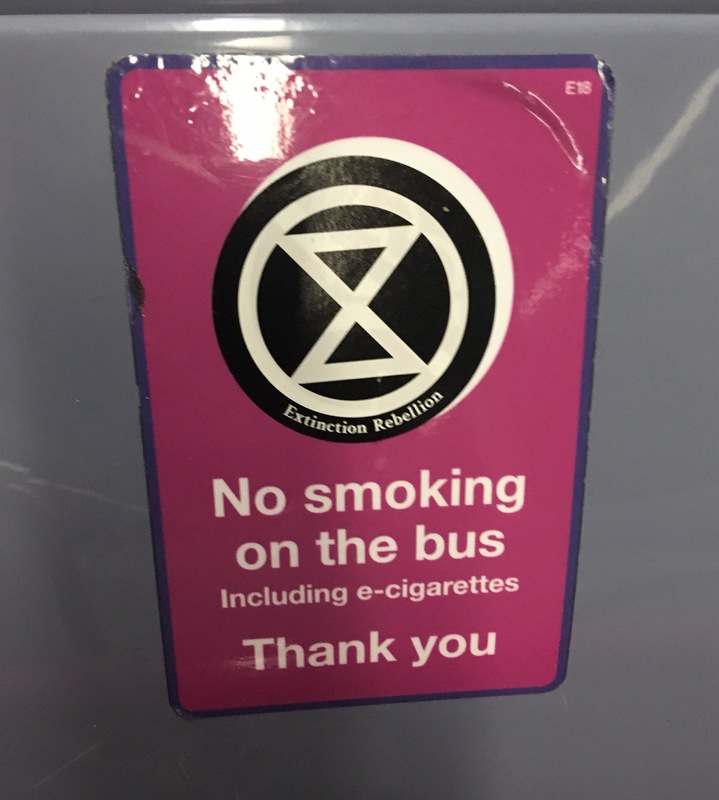 Extinction Rebellion is a socio-political movement intending to utilise nonviolent resistance in order to avert climate breakdown, halt biodiversity loss, and minimise the risk of human extinction and ecological collapse. A central XR principle is the use of Peaceful non-violent direct action and Civil Disobedience – methods which have been proven effective in forcing governments to take notice and institute changes; think Martin Luther King Jr, Gandhi, The Suffragettes. By Michael Tutton, THE CANADIAN PRESS on CTV News, Apr 16, 2019. 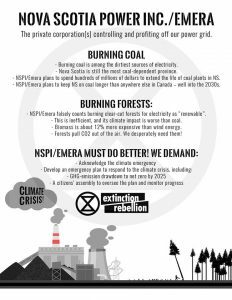 “Nova Scotia’s Liberal government wants to retrieve coal from old mines, even as its federal counterpart aims for the phasing out of coal-fired electricity…JoAnn Alberstat, spokeswoman for the Department of Energy and Mines, said in an email that Nova Scotia’s greenhouse gas emissions are already close to a third below 2005 levels.”Our approach to phasing out coal reflects the emission reductions we have already achieved, while keeping electricity rates affordable,” she wrote. Nova Scotia is a wonderland for nature lovers. Regardless of activity level, the East Coast province has something to appeal to adventure seekers, thalassophiles immune to motion sickness and folks who enjoy sightseeing at a glacial pace. Here are my top six outdoor activities to enjoy while visiting Nova Scotia.